Ilya Kabakov, 16 Ropes, 1984.
from Sculpture Magazine, July/August 2005. Crossing Red Square, it is clear that Moscow is a city where past and future confound the present: Kremlin walls, domed cathedrals, Versace bays at GUM, and picketing protesters carrying red banners lettered in Cyrillic. In a time when many Russian museums and cultural institutions are threatened with closing for lack of funding, the cultural administration, eager for the city to become a player in the 21st-century capitalist information age, staged a biennial that provided some insights into this confusing landscape. Joseph Backstein, the director of the Institute of Contemporary Art in Moscow, was chief curator. His renowned team—Hans Ulricht Obrist, Daniel Birnbaum, Iara Boubnova, Nicolas Bourriaud, and Rosa Martinez—tapped into local and global realities, attempting to mobilize and attract the political and cultural communities. The exhibition’s theme, “The Dialectics of Hope,” makes an ironic play on a utopia never found under communism and now lost to the pressures of capitalism. The main venues were the Lenin Museum and the Schusev State Museum of Architecture. Satellite shows of Russian art were sited at the Moscow Museum of Contemporary Art and the State Tretyakov Gallery, plus 38 parallel projects. In the Lenin Museum, some works commented on Lenin inside the building bearing his name. Lenin alone remains sacrosanct in the wholesale revision of Soviet history undertaken since glasnost. A compelling example of this was Mikhail Romm’s documentary, Lenin is Alive which reeled nonstop in the auditorium. 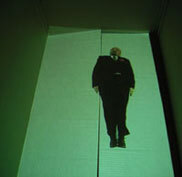 Blue Noses Group, a Russian artist collective, showed a series of projections in cardboard boxes. Beamed from below, the images were of people in antic movements. In one, a writhing figure of Lenin, dressed like the entombed body, was literally turning in his grave. Confused by the present, it seemed as if he wanted nothing more than to rest in peace. The Italian artist Micol Assael often chooses hermetically sealed, claustrophobic, dense, or hyper-charged spaces. In Sleeplessness, she revealed a new mindscape concerning the future and past of the Lenin Museum. Creating a cell of monastic simplicity, she replicated the freezing temperatures outside with open windows and refrigeration. Pinned to the wall was a picture of Lenin.Irina Korina, Modules, 2005. On the second floor, the Austrian group Gelatin constructed an interior wooden walkway cantilevered through a window to a toilet. Zapf de Pipi invited visitors to contribute to a 20-foot pee icicle. 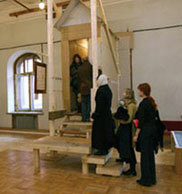 The work made formal reference to Ilya Kabakov’s The Toilets: Obscene Homes (1992). Works by Irina Korina, Tino Sehgal, and David Ter-Oganyan provoked dialectical tensions of material excess and formal concerns. Korina constructed a purposely too-large wood sculpture of interlocking volumes camouflaged with overlays of cheap decorative flooring and wall covering. Her work filled the room it shared with the performance artist Tino Sehgal, whose actors posing as museum guards performed strange repetitive movements meant to disorient onlookers who might otherwise be drawn into Korina’s object. Terrorism combined with the fate of the object was a tactic for David Ter-Oganyan, whose This is not a bomb scattered more than a dozen bomb-like devices throughout the museum. The work referred to productivity as well as to the impending disappearance of the formal object and the fate of the institution. Referring to the conflict between past and future—and their own countries’ engagement with Communism—Carlos Garaicoa from Cuba and Cao Fei from Guanzhou province in China produced provocative work of a different sort. Garaicoa suggested a possible conclusion to the emptiness left by idle words and political ideas. Running down a long corridor were glass vitrines containing multiples of Soviet stamps overlaid with imagery from Cuban socialist propaganda. The vitrines shared the corridor with Garaicoa’s altered photographs of Cuban billboards. On each of these, pins and thread trace the outlines of architectural dreams. Both the stamps and photographs are a call, as is the work’s title, to transform the political speech to reality, finally. Cao Fei’s My father consisted of a video, a group of small identical sculptures, and two large fabric sculptures. The installation related to her father, who was an official sculptor of Mao images. In courtyards and structures surrounding the Schusev State Museum of Architecture (where mostly video works were shown), projects by Christian Boltanski and Michael Rovner were installed. Their works related to the brutal past of Soviet Russia. Boltanski’s Odessa’s Ghosts celebrated stories relating to the migration of the artist’s grandmother from Odessa to Paris. The installation transformed its space into a dimly lit capsule for family memories—such as the garments suspended from the ceiling to depict those missing. The proximity of Israeli artist Michael Rovner’s work to Boltanski’s was well thought out. Her groups of minuscule (cell-size) people performing synchronized movements are apt meditations on politically enforced conformity and the eradication of human beings. One evening of satellite shows included a visit to Ilya Kabakov’s old studio, where his 1984 work, 16 Ropes was installed. An archive, spatial database, and journal, it records memories. Composed of strings holding objects in plastic with labels or vocal commentary, the work morphs to accommodate new sites and memories. Kabakov is said to be the father of Moscow Conceptualism—the subject for another satellite show and one of the most interesting artistic trends in late Soviet Russia. On the other hand, the “Russia 2” exhibition, paid for by the established art dealer Marat Guelman, illustrated the new capitalist Russia. Confusing art fair with biennial, Guelman featured only his stable of artists. “Apartment Exhibitions,” in contrast, was organized by the Radek Society, a group of friends who, from the ’60s through the ’80s, met for readings and debates. Driving through the blinding snow, we found Aleksei Kallima’s basement studio. Here, in the dimly lit space filled with scruffy artist-types, videos were viewed on small monitors. Alexei Beldakov’s video inspired by the language of computer errors and viruses stood out. The contrast of today’s technology and the unheated basement was that of old ways and new media. The show at the Moscow Museum of Modern Art, “Starz,” in all its garishness, celebrated a few contemporary Russian art-stars—Vladislav Mamyshev-Monroe, AES+G, Vinogradov & Dubbossarski, and Oleg Kulik, a radical artist whose abhorrence of the human condition is manifested in his animal performances. The opportunity to educate and enlighten artists, curators, critics, institutions, politicos, collectors, and potential philanthropists is one not to be missed. Yet success can be measured in small increments contingent on aspiration and on echo. For now, in the absence of support for arts organizatons and without strategies (such as Documenta 11’s “Platforms”) to engage diverse and relevant groups, it seems a hollow move to simply produce another mega-exhibition that briefly fluffs the vanity of the city and amuses the elite.